The first thing you see in the room is Donald Trump. Thumbs up, white teeth locked in a grin. He has been here for months. At the Republican Party’s headquarters in Martinsburg, a quaint town of some 20,000 people in West Virginia, it seems Betsy, a 73-year-old volunteer, is not alone. Posters and leaflets for those running in Tuesday’s midterm elections boast of endorsements from the president. Some simply carry the word ‘TRUMP’ in lettering as large as the candidate’s own names. Everything is done to play up a link to the commander-in-chief. Walk three doors down the street and it is the same story, but in reverse. At the Democratic Party’s local office the president is conspicuous by his absence. The dozen posters plastered across the front of the former department store carry no mention of Trump. Leaflets stress the party’s link to veterans or record protecting the coal industry, but avoid taking aim at the Oval Office. The reason is obvious. Trump won West Virginia big in 2016. He beat Hillary Clinton in every county – something he managed in only one other state, Oklahoma. In fact, Trump won by a jaw-dropping 42 percentage points. Not since Abraham Lincoln was re-elected during the civil war has there been such a convincing presidential victory here. All of which is a problem for Joe Manchin. The Democrat senator has been representing this state since 2010 and hopes voters will give him another six years next week. His predicament is not unique. No fewer than 10 Democrat senators are up for re-election in states that Trump won two years ago. If all of them hang on, the Democrats have a shot at taking the majority in the US Senate, dealing Trump a massive blow. But if just a couple fall short, that is all but impossible. It is one of the most significant dynamics in next week’s elections. The fight for political survival has seen Manchin – a 6ft 3in former high school American football star – embrace Trump more than any other Democratic colleague in the past two years. The 71-year-old voted through many of Trump’s cabinet picks despite Democratic opposition. He has talked about how much the pair chat on the phone. And, last month, Manchin did something no other Democrat would do – he voted for Brett Kavanaugh, the president’s controversial pick for Supreme Court justice. The decision horrified liberals, who saw the accusation of sexual assault during a high school party levelled at Kavanaugh – which he denied – as disqualifying. But speaking during a campaign debate last Thursday night, Manchin framed his vote as a positive. “He had experience,” Manchin said of Kavanaugh. “His whole resume was great. His education, his standing in the community – everything looked good.” The senator added that the accusation had been investigated by the FBI, which found no corroborating evidence. Current signs of Manchin’s strategy of wooing Republicans are easy to spot. One campaign advert shows him aiming a gun and shooting Barack Obama’s ‘cap and trade’ bill to limit greenhouse gases. Another advert, entitled ‘Freedom’, shows him riding a motorcycle through West Virginian countryside. A third boasts that he is rated the most independent senator on Capitol Hill. And, remarkably, it appears to be working. With just days to go, Manchin is a few points ahead of his Republican rival Patrick Morrisey, the state’s attorney general, in the polls. But last Friday, Trump flew in hoping to change all that. Holding a rally in Huntington, he ushered Morrisey on stage, praising his energy on the campaign trail. The president mocked Manchin for only announcing his support for Kavanaugh once enough votes were secured for him to be confirmed thanks to Republican senators. Trump also returned to familiar themes, repeating warnings about the migrant caravans approaching the southern border. 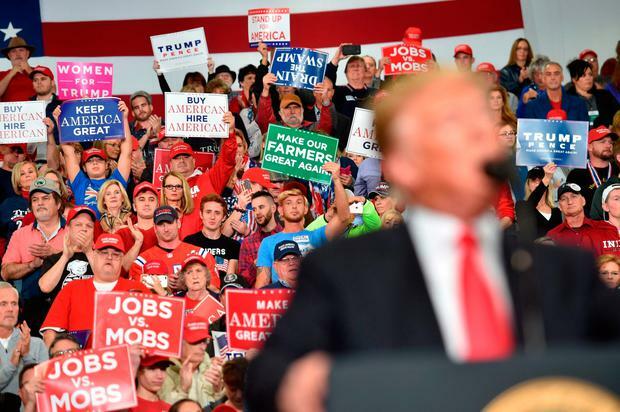 Similar scenes have been playing out for weeks, with Trump far surpassing his White House predecessors in the number of midterm campaign events he is holding. No fewer than 11 campaign stops in the final week are planned – zeroing in on Senate races amid signs that the Republicans expect to lose the House of Representatives. Back in Martinsburg, Betty was gutted to miss the president’s visit. She has already attended two Trump rallies this year but wanted to make it a hat-trick. “I would have loved to have gone,” she said, while the president’s cardboard cutout looked on. Whether other Trump voters remain as loyal may well determine who holds the Senate. Q What are the midterm elections? A All seats in the House of Representatives and a third of seats in the Senate (the two bodies that make up US Congress) are up for grabs. Q What will it tell us and why does it matter? A It is the first time we really see what voters are thinking about Donald Trump’s presidency. The results could also have an impact on how the next two years play out. Q How might it affect Donald Trump? A Currently the Republicans hold majorities in both the House and the Senate.The Democrats could take the majority in one or both, making it much harder for Trump to pass laws. If that happens, new congressional investigations into the president could also be launched. Q Realistically, how likely is that to happen? A Democrats are very hopeful of taking the House – just a small swing of seats would hand them a majority. However, winning back the Senate is much harder. About threequarters of senators up for re-election this year are aligned to the Democrats, meaning making overall gains is hard. Q Could it change the chance of impeachment? A Yes. Impeachment, the process of removing a president from office, starts in the House – so if the Democrats have the majority, it is more likely to happen. However, few leading Democrats are publicly suggesting such a move.